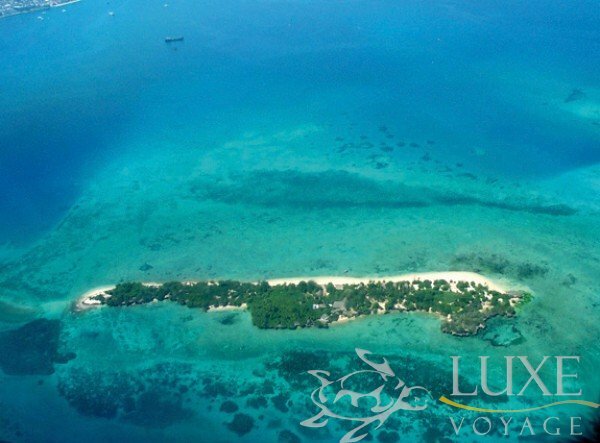 Chapwani is a private island of 5 hectares situated north-west of Zanzibar town, reachable by a comfortable 25 minutes boat ride. There is a little island surrounded by a beautiful coral reef and immersed in crystal blue waters, filled with starfish and multi-coloured corals; an amazing beach touched by the tepid monsoon; the horizon lit up by a tropical sunset: its name is Chapwani. Ten cozy rooms furnished in local style, each one with a sea view allow you to share this exclusive resort with only a few other guests and to take advantage of an exclusive, personalised service in a real oasis of peace and tranquility. 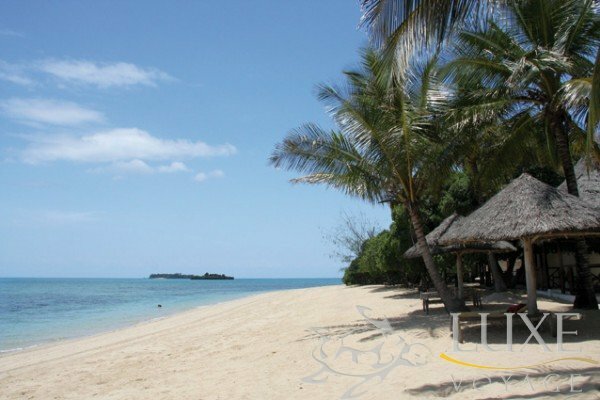 A natural background for those who want a romantic getaway, pure relax and an unspoilt environment, Chapwani island offers a complete break away from timetables and daily life. In the rooms you won’t find either telephones or televisions: just enjoy the natural sounds in peace of this rare tropical scenery. 15 minutes by boat from Zanzibar Town, Chapwani is a small private paradise, where the flexibility and politeness of the staff means that guests will have an unforgettable stay. For any travelling, guests may use the island´s free service - there is a boat every morning at 10.00 which leaves the island for Zanzibar Town and comes back at 13.30. If guests prefer to be more free and autonomous, Chapwani can organise transport at other times during the day, at a small fee. 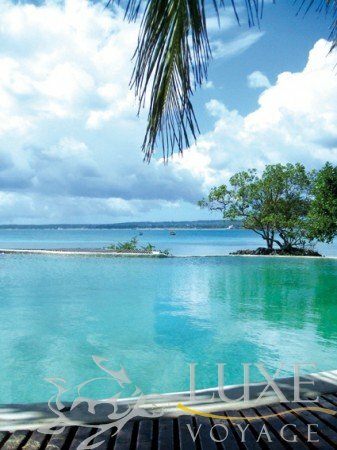 Chapwani offers the possibility to show its guests the real and more authentic Zanzibar, where sea and land join together in a unique blend of colours and perfumes. 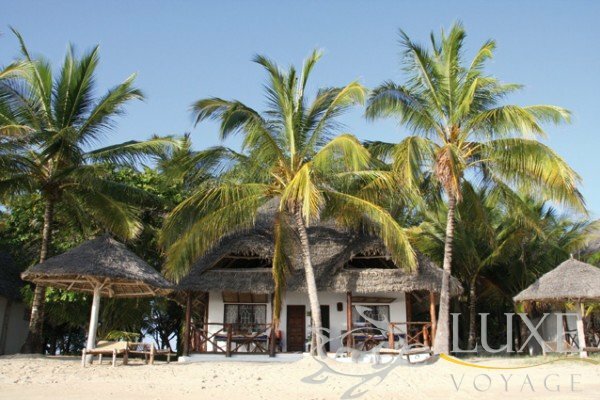 Whether you are in the water, on a sand dune, on the beach, among the historical dwellings of stone Town or immersed in the fragrances of the Street of the Spices, you will be able to enjoy the neverending beauties this land holds in store for you. Chapwani has at its disposal a typical local boat, built by the local Zanzibar shipwrights, which will take the guests out on fantastic excursions to discover the wonderful deep seas, the sandbanks with their packed sea bird colonies and little islands adjacent to Chapwani, like Prison Island. In olden days, the forced dwelling for slaves, to then be a quarantine zone and today a tourist destination and home to some giant tortoises which come from the colony of Aldabra in the Seychelles. Spending a wonderful day with our fishermen very rarely disappoints and is within the reach of anyone, since it is not very difficult technically and regular catches by fishing line, in true tradition of over centuries, is almost guaranteed. Snorkelling is like deciding to enter another world; the coral reef, a natural wonder to be protected and preserved, forms an eco-system that must be explored even with just a mask, flippers and tube, which are provided by the staff free of charge. The underwater world is within the reach of everyone, whether beginners or experts. 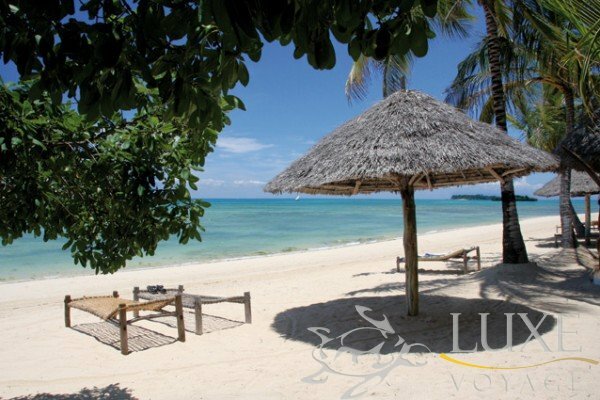 The unique marine species, the bright colours of the reef, the total silence of the deep seas are among the fascinating attractions of the immersion places in Zanzibar. 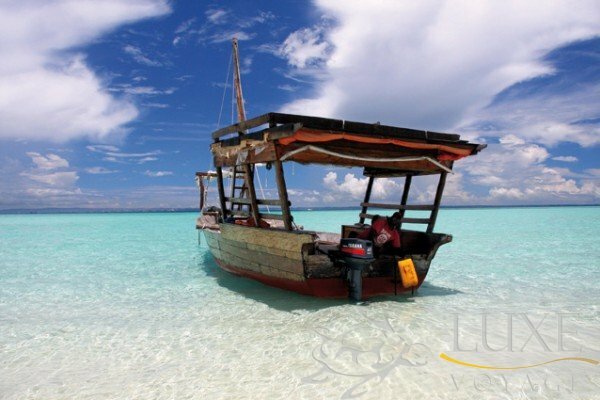 For the more expert, Chapwani Island proposes an arrangement with special fees, with a local diving school which will take you to discover the crystal blue waters of Zanzibar. Each room in Chapwani evokes the Zanzibarian elegant but casual style: high pointed roofs with wood beams, ceiling fan and and brightly coloured materials. 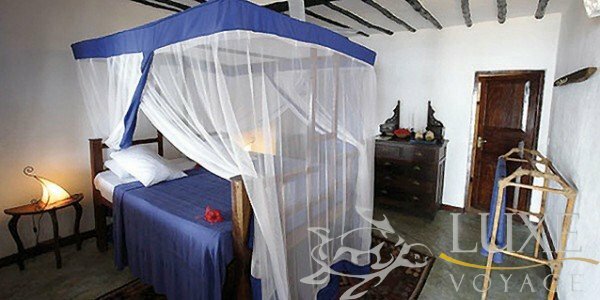 Ten rooms are laid out in 5 bandas overlooking the sea; each one has a canopy bed with mosquito net and a terrace overlooking the beach. 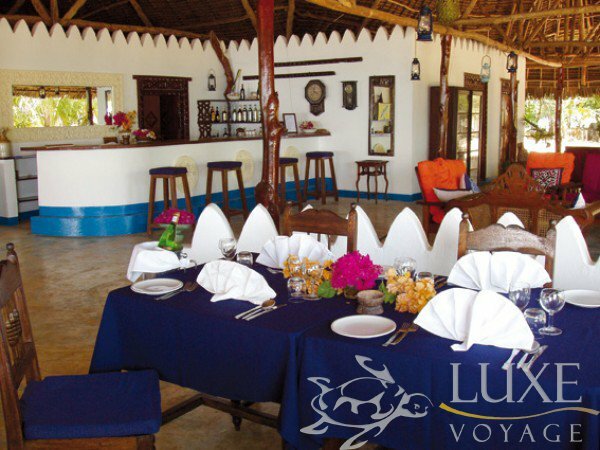 The restaurant has a cosy environment overlooking the sea, situated in the centre of the resort and is in typical local architecture inwood and makuti. The cooking specialities are based on fish with a selection of recipes depending on what the catch is, which propose a mix of flavours and aromas, tainted by ethnic and Zanzibar influences: a cuisine respectful to the territory, knowingly revised by the cooks of the island who have a professional background, overseen by an Italian chef. The meals, on special occasions, can also be personalised and served exclusively at the edge of the pool or on the terrace of your own bungalow, where the panorama and flavours harmoniously combine to make an unforgettable experience. The bar zone is situated in the area adjacent to the restaurant, and is divided into various corners, all strategically placed and offer comfortable sofas with brightly coloured cushions and areas to relax in. During the day you can taste thirst-quenching tropical cocktails made with fresh fruit and at sunset it is pleasant to try aperitifs along with the warm light coming from the laterns which create a relaxing atmosphere, creating some very unforgettable charming moments.